Travel to Namibia, South Africa, and Zambia to capture remarkable moments on your camera with professional photographer Scott Davis. 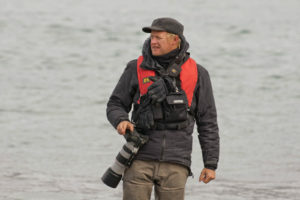 You’ll visit some of the best sites to photograph southern Africa’s quintessential wildlife and its iconic landscapes. You’ll visit South Luangwa National Park in Zambia and Sabi Sand Private Game Reserve (part of the Greater Kruger National Park system) in South Africa, regions with incredibly accessible biodiversity including Africa’s Big Five (lions, elephants, rhinos, leopards, and buffalo) and many beautiful birds. Discover the picturesque red sand dunes and salt pans of Sossusvlei in the Namib Desert of Namibia. Encounter nocturnal wildlife and do some star-gazing during evening game drives. This safari will provide you with opportunities to capture quality images of unique African wildlife and beautiful landscapes. • Learn wildlife, landscape, and nighttime photography techniques from naturalist and professional photographer Scott Davis. • Study and photograph wildlife behaviors from safari vehicles and special observation blinds at South Luangwa National Park, known for large congregations of game animals like elephants, giraffes, and zebras. • Explore Namibia’s famous red sand dune and salt pan landscapes. Hike to the top of Dune 45! • See great predators such as lions, cheetahs, leopards, African painted dogs, jackals, and hyenas. Jul 23 Travel to Johannesburg, South Africa. Depart from home and travel to Johannesburg, South Africa. Arrive in Johannesburg where you will be greeted at the airport and transferred to your hotel. Fly to Mfuwe, Zambia and then drive to Kaingo Camp at South Luangwa National Park. You’ll have game-viewing opportunities on foot, by private vehicles during daytime and nighttime, and from observation blinds. The camp’s network of photography blinds is perfectly situated for wildlife observation and photography. They include a hippo hide and an elephant hide that offer great views of the wildlife within this pristine environment. South Luangwa is touted by many travel experts (e.g. Lonely Planet, Fodor’s, TripAdvisor) as being one of the greatest wildlife sanctuaries in Africa. The Luangwa River is the most intact major river system in Africa and supports life within the park's 9,050km2. More than 60 mammal species and 400 bird species reside along the river. You’ll encounter local and incredibly varied fauna, including lions, leopards, zebras, giraffes, wild dogs, and many charismatic birds like the carmine bee-eaters. During night drives in the Luangwa, you’ll have opportunities to see leopards and many other nocturnal animals. You may encounter African civets, common (or small-spotted) genet, spotted hyenas, nightjars, honey badgers (ratels), and lions. On most nights you may hear hyenas and their plaintive, eerie cry – very characteristic of the African bush. This morning, enjoy wildlife action near camp. After breakfast you’ll fly from Mfuwe to Windhoek, Namibia where you can explore Namibia’s capital city or relax at the lodge. Fly mid-morning from Windhoek to an airstrip near Sossus Dune Camp to begin exploring the Namib Desert. Enjoy daytime nature drives through the famed Sossusvlei region of the desert, known for its red sand dunes and salt pans. You’ll visit iconic landmarks of this region including taking a guided walk in the Sesriem Canyon, photographing and hiking up Dune 45, and exploring the Petrified Dunes where sand has turned to stone. The landscapes here vary, including canyons with narrowly carved corridors, salt pans with old acacia trees, and vast seas of red sand dunes, making this region a natural marvel with excellent photography opportunities at every turn! After breakfast, enjoy your last day in Namibia with a scenic flight to Windhoek, and then fly to Johannesburg. In the morning, you’ll fly to Sabi Sand Private Game Reserve, part of the Greater Kruger National Park. Sabi Sand was once agricultural land where farmers bored holes into the ground for water wells. Those water wells now serve as watering holes, bringing the resident wildlife together to congregate en-mass and providing you with an excellent place to watch for predators hunting their thirsty prey. Sabi Sand is well-known for its leopards – these particular animals are accustomed to the vehicles and so many of their behaviors, including hunting, are more easily observable here than in other regions. You may also photograph cheetah, Burchell’s zebra, giraffe, common wart-hog, and honey badger. You will also have the opportunity to see birds such as the ostrich. Take early morning game drives to see zebras grazing in the open plains, elephant herds gathering near the water, giraffes pacing across the landscape, and lions resting in the shade. You’ll also have opportunities to get up close and personal with the animals during walking safaris guided by armed rangers and experienced trackers. In the evening, after dinner at the lodge or in the bush, join game drives in search of the elusive nocturnal wildlife and enjoy the magnificent stargazing that these remote skies offer. Fly back to Johannesburg in the morning and continue on your international flights homeward. Experience the incredible beauty of southern Africa’s wildlife and stunning desert landscapes. Costs are per person, double occupancy, not including airfare (except seven internal flights listed as included), singles extra. See Included and Not Included sections for more details. Seven internal flights between July 25 and August 7. Accommodations (double occupancy) for the nights of July 24 through August 6. Meals from breakfast on July 25 through breakfast on August 7, except meals listed in Not Included section. Lunch on July 29 and August 2; these are days when participants are transiting through airports at lunchtime, so lunch can be bought from airport restaurants or kiosks. Gratuities – tipping is, of course, discretionary, however we suggest budgeting about $30 to $32 per participant per day for July 25 to August 5 with our local guides (about $360 to $384 total per participant). Daily temperatures in July and August vary from below freezing 32°F (0°C) up to about 85°F (29°C) during the day with the possibility of some rain. In the last five years, the dynamics of climate change have impacted the area with an increase in temperatures, so dress in layers. Minimal fitness level is required. Our game drives require good energy levels, as some days are long. Most travel is in open-air safari vehicles on sometimes dusty and bumpy roads. You will have opportunities for short, relaxed hikes, usually less than one mile over varied terrain (sand dunes, flat areas, hilly and grassy areas, or rocky slopes) and, at times, uphill for about 20–30min. Please contact us if you have any health concerns that may make this trip challenging. Flights you (or a travel agent) book: Arrive in Johannesburg, South Africa (JNB) by July 24. Depart from Johannesburg airport (JNB) late in the afternoon on August 7. Flights we book for you: The seven internal flights between Namibia, South Africa, and Zambia during your safari from July 25 to August 7. The cost of these bookings is included in the tour cost. The lodging ranges from modern to luxurious. For stays of more than one night, we stay at very high-end camps and lodges where stunning views, modern amenities, excellent food, and extreme comfort are all prioritized. The lodges have restaurants, internet access, and laundry service. The rooms have en-suite bathrooms, private outdoor seating, as well as outdoor showers/baths – after a long day in the bush, you may appreciate a warm bubble bath with a sunset view.